Rancho Monserate was a 13,323-acre (53.92 km2) Mexican land grant in present day San Diego County, California given in 1846 by Governor Pío Pico to Ysidro María Alvarado. The grant extended south and east of the present day Fallbrook down to the San Luis Rey River. The grant was bounded on the west by Pico's Rancho Santa Margarita y Las Flores. With the cession of California to the United States following the Mexican-American War the 1848 Treaty of Guadalupe Hidalgo provided that the land grants would be honored. 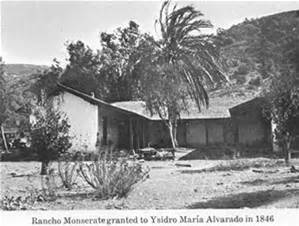 As required by the Land Act of 1851, a claim for Rancho Monserate was filed with the Public Land Commission in 1853, and the grant was patented to Ysidro María Alvarado on July 17, 1872. Tomas Alvarado, second of three children, was born on Main Street in Los Angeles on December 21, 1841, and married María Ygnacia Morena, the widow of Lorenzo Soto, on June 4, 1864. He received the eastern third of Rancho Monserate in 1874 and built an adobe chapel and a hacienda on the south side of San Luis Rey River. There, the family raised six daughters and one son. Today, the adobe chapel is the only remaining structure from that time period. It has been restored with the combined efforts of the Fallbrook Financial Corporation, the San Diego Historical Society, the County of San Diego and the Rancho Monserate Country Club.